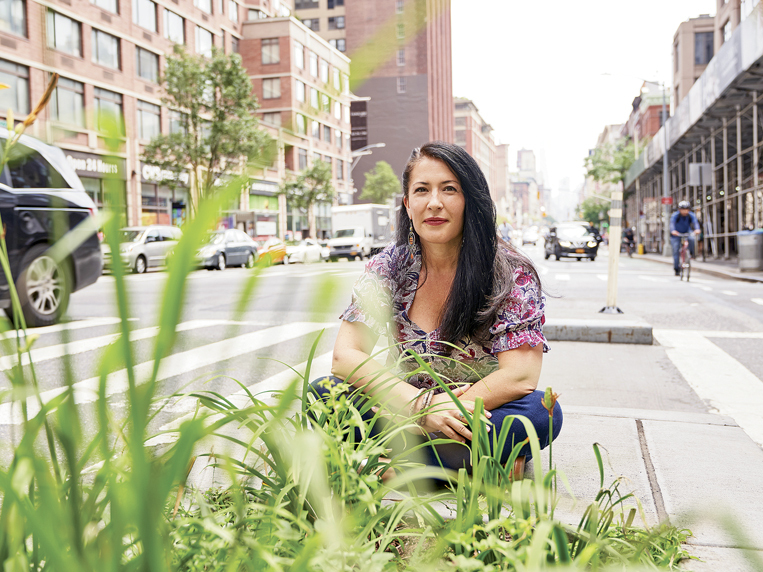 Ada Limón is a North Star poet for me. She’s up there with Lucille Clifton, W. S. Merwin, and Adelia Prado in a great influential constellation. I’m drawn to Limón for the same reasons I’m drawn to the others: It’s as much for her surprising and sublime departures as for the earthbound truths they lay bare. And I have feelings when I’m inside her poems. I sigh. I laugh out loud. I cry. A lot. I do, I cry a lot. Often when people hear of a reader having an emotional response to a poem, the engine assumed to be driving that response is the narrative subject matter: the familiarity of it, perhaps, or the dramatic imagining of it. It’s the compliment narrative poets like myself have come to dread—the relatability of the poem. That happened, or that could have happened to me, thus this is a successful piece of art. And, of course, great poems like the kind Limón writes often incorporate emotional subject matter and narrative. But focusing on subject matter alone doesn’t do powerful poetry like Limón’s justice. What drives her poems—what makes her new collection, The Carrying, so moving and masterful—is her dexterity with voice and diction and her giftedness with metaphor. It is her deep wellspring of surprising and evocative images and her syntactic superpowers. Most of all, it’s her intellect and intelligence. The poems are keen reflections of a mind constantly at work, seeing and wondering and moving toward meaning but not always the meaning to which the poem and its reader thought they were headed. The Carrying, published in August by Milkweed Editions, follows Limón’s four previous collections, including Bright Dead Things (Milkweed Editions, 2015), which was a finalist for not only the 2015 National Book Award, but also the Kingsley Tufts Poetry Award and the 2016 National Book Critics Circle Award. It was also named one of the top ten poetry books of the year by the New York Times. Her earlier books include Lucky Wreck (Autumn House Press, 2006), This Big Fake World: A Story in Verse (Pearl Editions, 2006), and Sharks in the Rivers (Milkweed Editions, 2010). Limón, forty-two, serves on the faculty of the low-residency MFA program at Queens University of Charlotte in North Carolina and the 24 Pearl Street online program for the Fine Arts Work Center in Provincetown, Massachusetts. She splits her time between Lexington, Kentucky, and Sonoma, California. We had this conversation over the course of a week, just as the first advance copies of The Carrying were making their way into the world and just after I’d swallowed my copy whole. Carrie Fountain: Ada, your book blew me away. Even the second time I read it—“Come on, Fountain, get it together”—I could hardly do anything but cry and sigh and gasp at the art of the poems, especially the very surprising revelations on which they open at their endings. It’s a gift. There are readers out there right now ready for, waiting for, needing these poems to change their lives. As a maker and a reader of poetry collections—these weird books that aren’t necessarily narrative or even inherently linear, but also aren’t random in terms of tone or subject matter or voice—one of the things I admire most is how full The Carrying is and how complete and collected it feels as an artistic gesture. There is so much here of the world, of the beauty and responsibility and heartbreak of going through life in a human—a woman’s—body, and deep existential questions about life and legacy and fate. So, how did you make it? You know: How? And how did you know when you were finished, when it had gone from a group of poems to a collection? Ada Limón: Oh, Carrie, thank you for this. It’s odd, the making of a poetry book, isn’t it? We write one poem at a time. One small poem and then, hopefully, another one comes. With The Carrying, I was experiencing long periods of painful silence, feeling completely overwhelmed by the degenerating state of the world, but then I would be reminded of how writing can bring me back to the world, into my being. In many ways the poems in The Carrying were answering the question, “Where do I put all this?” The poems came in fits and starts, and sometimes they’d flood over me, and sometimes I’d stare into the abyss for a long time wondering if I’d ever write again. When I finally had about thirty poems, I realized I was writing something real, making a complicated living thing. Then I started to push myself to plunge further, to be as veracious as possible and follow the craft, follow the song as far as it would take me. Before I even realized it, the manuscript was nearly done. To be totally honest, the book still terrifies me. But maybe that’s a good thing? Fountain: I think I know that terror, and the accompanying feeling that maybe it’s a good thing, a good signal about the particular qualities of the art you’re about to release into the world. I’d love to hear you say more. Did you feel this with your previous books? What is it about The Carrying that terrifies you? Limón: I think what scares me the most is that I’m writing more about the body and from a place of physical vulnerability. In my previous books I have been open to an emotional vulnerability, but in The Carrying I address more of the frailty of my own body. I also think this book is more overtly political than other books I’ve written. I feel like some part of me has lost interest in play, in poetry for the sake of play, and now I want only to get to the root of things. This book feels driven by a serious engine. I’m not saying it doesn’t have hope. I do have hope, too, but much of the poems are written from inside the well with only a glimmer of light coming from the earth’s surface. I lost God awhile ago. There’s so much going on in these poems under the surface. Many of them make their turn down there, below. Is this something you were working toward actively as an organizing metaphor, or was it more a subconscious thing—a thing beneath the surface—or was it coincidence? Tell me what it means to you to “get to the root of things” in poems. Limón: In your poems I always see the trembling thing underneath. I suppose the main thing that I mean by “the root of things” is that I am most interested in the process of writing poems as questions, as a troubling of the water, sending down the echo sounder and seeing what comes back. But also my obsession with physical roots is true too. Trees, trees, and trees. No one has ever called me a nature poet, but nature is what I return to most frequently. The earth below our feet, the water that moves through us and connects us to the oceans and rivers. And how we are nature too, even in our own destruction. How the human animal is also an animal. Fountain: It makes me wonder what a nature poet is, if you’re not considered one. It isn’t that there’s not enough nature in your poems. I’m laughing thinking of the nature quota set by…Gary Snyder, Mary Oliver? Counting how many birds alight on branches in early morning, how many vistas, how many species of cacti named. But then again, your poems aren’t contained wholly in nature—not containable by any category, really. Your poems contain the natural world, but also the world-world, the world of highway overpasses and torn pink tank tops and your funny friend Manuel—who’s my friend too! And beyond the image level, your poems aren’t “about” nature. I read “The Burying Beetle” to my husband, and the two of us discussed it at length, its many turns and gestures. Neither of us ever talked about it as a nature poem. Still, I’m interested in these labels because I think they’re sometimes more about who gets to write what, or who is expected to write what. I think that’s changing—the lines are blurring, the categories are widening, there are more voices—but not fast enough. Your poem “The Contract Says: We’d Like the Conversation to Be Bilingual” examines this, doesn’t it, in a searing, hilarious way? The world sometimes wants to tell poets what they as poets, especially women, especially writers of color, should write about. Your poems and your presence in the world of poetry upends these expectations in such a wonderful way. You’re you. You’re Ada. You truly contain multitudes. I think this is important and inspirational for the generation of poets coming up. When my first book came out, someone in a review called it “fake ecofeminism.” It was a man, shocker. Another guy—in the Harvard Review—said the poems were obsessed with my “body parts.” Back then I was hurt. I felt ashamed. There were only one or two body parts in that book. Most of the poems are about the conquest of the New World. Still, I heard that review and I just took it in. I didn’t know any better. Maybe I was too much: too sexual, too conversational, too woman. And at the same time, maybe I wasn’t enough—not intellectual enough, not valid enough, not a man’s woman poet. Some of the most powerful poems in The Carrying are about intimate things, women’s things: trying to get pregnant, coming to terms with not getting pregnant, the many ways we’re forced to change our idea of what our lives will be in the child-rearing department. Even the love poems here—and there are so many, so lovely—are about the tender, weird, specific qualities of married love. I wonder: Do you feel there’s been a shift in the way women’s voices are read in poetry, especially women of color? And maybe all this is a roundabout way of asking, Who is your ideal reader? Do you have one? Has it changed? Limón: I think you’re right. The uselessness of poetic and stylistic categories is becoming more evident as poetry and the world continue to evolve. The idea of divesting ourselves of our own internalized misogyny, of granting ourselves permission to write about whatever world we live in, of silencing the grouchy goateed hipster critic inside that writes cheeky snark from his parents’ basement in order to prove his own intelligence, that’s some of the heaviest work we do. Silencing that good-ol’-boy critic that lives in you and scares you into thinking, “Should I take the ‘I’ out? Should I erase my being?” I’m still working on silencing that dude. Daily. When Bright Dead Things came out, I was nervous about the fact that it spoke about “the body” and loss, and I worried that it would be seen as sentimental. For the first time in my poems, I wasn’t thinking of writing to prove anything, to show off formal acrobatics, but rather I was writing the poems I needed for my own survival. I was disavowing myself from a “project” and just working on what mattered to me. I had no idea what would happen once those poems entered the world. It was thrilling to see people respond favorably, but it was absolutely not what I was expecting. Still, there were reviews that spoke of “identity” being the driving engine and even “shallow identity verse,” which seemed to be saying that if I wrote about being a woman, being Latinx—or, oddly, even if I didn’t—by default my poems were being driven by only a sense of alienation or, worse, manipulation. I maintain that this does not happen as much to men. It’s funny that you brought up a reviewer writing “fake ecofeminism” about your work, as I received the descriptor “bogus feminism” in a particularly negative review, written by a man. I don’t think of it anymore, and I do like what you say about, “Hey there, this isn’t for you.” I happen to like the ocean and black-and-white movies, but it doesn’t mean we all have to. You can go on liking slushy machines and Fox News. I do think there’s been a shift in how we not only read women, but also how we talk about the work. It’s slow, however, and it’s frustrating, but it’s shifting. I think, for me, it all comes down to permission and capacity. I’m giving myself permission to write the poems I want—as different as they all are—and I am focusing on the human capacity to hold within us so many different things at once. I don’t know if I have an ideal reader, but I know that with The Carrying, I’m writing for someone who perhaps has gone through the same things as I have, or similar things. Perhaps the older you get, you realize that so many people are suffering in so many ways and you get tired of privileging your own pain, or imagining your own isolation. I suppose, if this book is for anyone, it’s for those who have both struggled and searched for a way back into the world. Fountain: This isn’t your first rodeo by any stretch. The Carrying is your fifth collection. You’ve been at this a while now. We’ve talked a little about how this book feels different now, as it makes its way into the world, but I wonder, too, how has your writing practice changed over the years? What have you learned about yourself as a writer, and what continues to evolve? Limón: Like you, I’ve written for a long time now. I’ve written seriously and with purpose for twenty years. I’ve written a failed novel, a messy draft of a YA novel, and poems, poems, poems. So many words, and all the while I hope I am getting to be a better, smarter writer every day. Speaking of which, I’ve only just started I Am Not Missing—your new young adult novel—and I’m obsessed with Miranda the half-Mexican girl who is the story’s protagonist. She’s wonderful. One of the things I’ve learned this far into a life in language is to be grateful about all of this. I get to read and spend time with words as a vocation. Yes, it’s work, and there is so much failure and so much getting it wrong. But still, we are so lucky. I wish people talked about that more. Just to be able to do this work, to meet people along the way, to celebrate other writers, to live in a life of words? I can’t tell you how grateful I am for that gift. As corny as that sounds, I don’t know where I’d be without poetry. Fountain: I’d love to hear more about your fiction writing. So many times, while reading your poems, I’ve thought, “I’d love to read Ada’s fiction.” I have this feeling only for my favorite poets, the ones who really take me to a place and time. This isn’t about the narrative quality, but rather it’s about a surprising, specific image and inviting voice. Do you have a yen for writing fiction? Limón: I love that you ask that. I do love to write fiction, but I’m not sure if it’s my strong suit. I think I need to keep practicing and keep learning. Right now, I think I write very “poetic” fiction. You know, there’s a lot of a woman standing in a field thinking about other times she stood in a field. All my plot shifts are emotional and psychological. What I love most is describing—both the landscape and the humans and their interactions. I love dialogue, too. But I think I’m a little too satisfied when nothing happens. That’s what I admire so much about your work. You’re this exquisite poet with an excellent ear, and an internal engine of unraveling drives your poems, but you are also able to write a real story. I Am Not Missing just moves so well and real things happen, big things. I’m envious of your storytelling ability. Maybe I’ll get there someday. Maybe my characters will stop daydreaming and go on a real adventure one of these days. Fountain: I know The Carrying is hot off the presses, but I can’t help but want to know what you’re working on now. Where are you headed? Limón: I think I will work on napping next. And gardening and breathing and wandering. It’s been a wild three or four years making this book, and I might rest my poem brain a bit. That said, I just wrote a poem today. So maybe poems will just come eventually? I am also working on some personal essays. These days I’m just trying not to rage too much at the world while still staying active and aware and working toward truth. On a good day, I just work on being a real person who wants to make real living things and give them to the world. Carrie Fountain’s poems have appeared in Tin House, Poetry, and the New Yorker, among many other publications. She is the author of the collections Burn Lake (Penguin, 2010) and Instant Winner (Penguin, 2014). Her first novel, I’m Not Missing, was published by Flatiron Books in July. Fountain received her MFA as a fellow at the Michener Center for Writers at the University of Texas and is now writer-in-residence at St. Edward’s University in Austin. She lives in Austin with her husband, playwright and novelist Kirk Lynn, and their two children.